Have you ever wondered how the government's misinformation gains traction? In my recent article, “Creating Evidence Where There Is None,” about the alleged killing of Osama bin Laden by a commando team of US Seals in Abbottabad, Pakistan, I provided a link to a Pakistani National TV interview with Muhammad Bashir, who lives next door to the alleged “compound” of Osama bin Laden. I described the story that Bashir gave of the “attack” and its enormous difference from the one told by the US government. In Bashair’s account, every member of the landing party and anyone brought from the house died when the helicopter exploded on lift-off. I wrote that a qualified person could easily provide a translation of the interview, but that no American print or TV news organization had investigated Bashir’s account. Does anyone remember the "cakewalk war" that would last six weeks, cost $50-$60 billion, and be paid for out of Iraqi oil revenues? Does anyone remember that the reason Dubya gave for invading Iraq was Saddam Hussein's weapons of mass destruction, weapons that the US government knew did not exist? Alex Jones welcomes back to the show economist and a nationally syndicated columnist Paul Craig Roberts, who recently announced his journalistic retirement in an article entitled “Truth Has Fallen and Taken Liberty With It.” He served as an Assistant Secretary of the Treasury in the Reagan Administration. Mr. Roberts is the author of several books, including The Tyranny of Good Intentions: How Prosecutors and Bureaucrats Are Trampling the Constitution in the Name of Justice and How the Economy Was Lost: The War of the Worlds. 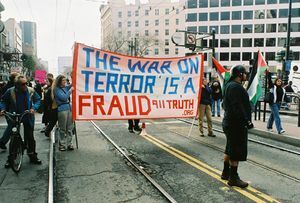 Paul Craig Roberts expresses his frustration with the censorship of 9/11 and why he is no longer going to write his bi-weekly column for such sites as Counterpunch and AntiWar.com. He explains that if people can't deal with 9/11 they can't adequately deal with any of the other important topics we are needing to deal with as well.